Made for dark coloured cars to give an extra boost in depth and shine, Poorboys World Natty's Blue Paste wax is a slightly different formulation from the regular Natty's. Just like before, Natty's Blue can be applied in sun or shade and is still the easiest paste wax to apply and remove. 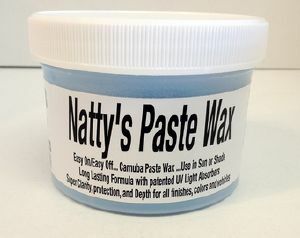 Natty’s Paste Wax Blue is a high quality car wax without the high price typically associated with Carnauba waxes. Patented UV light absorbers keep your paint fresh and protected throughout the life of the wax. You can also apply additional layers to increase the depth and glimmer.